A Moroccan Salad with Quinoa and Chickpeas — soon to be your new favorite lunch! 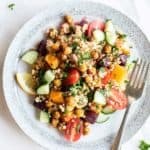 This healthy and hearty vegan quinoa chickpea salad is loaded with veggies and plant proteins, and pulled together with a bright and zippy lemon vinaigrette. 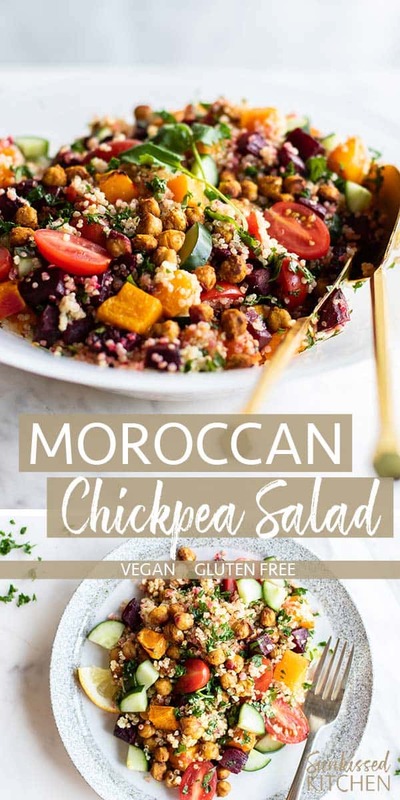 This beautiful vegan quinoa chickpea salad is based off my favorite meal — possibly my favorite recipe on the blog — the Moroccan Chicken Quinoa Salad. Recently, I meal prepped a double batch of that salad. I can eat it for breakfast, lunch and dinner! I knew I needed a second version, a vegan version with crispy baked chickpeas. 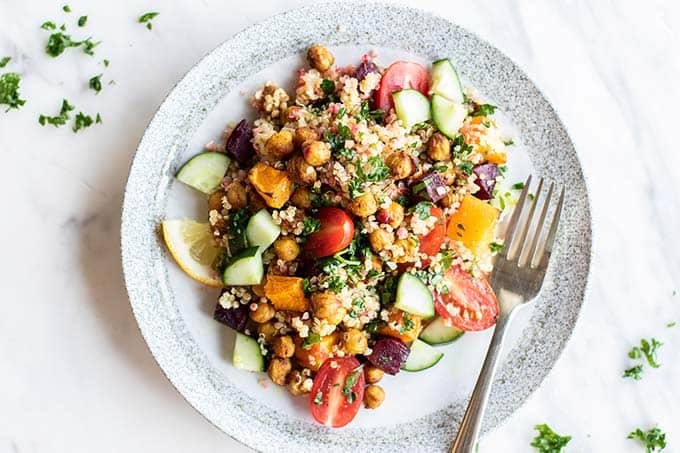 This vegan Moroccan Salad is perfect for fall, when you need heartier meals to get you through the chilly days. This salad combines the best of fall and summer food. I layer quinoa with crispy Moroccan spiced chickpeas, and sweet roasted beets and butternut squash. Mix that with fresh tomatoes and cucumber, and lots of fresh herbs, and we’ve got something pretty special on our hands. 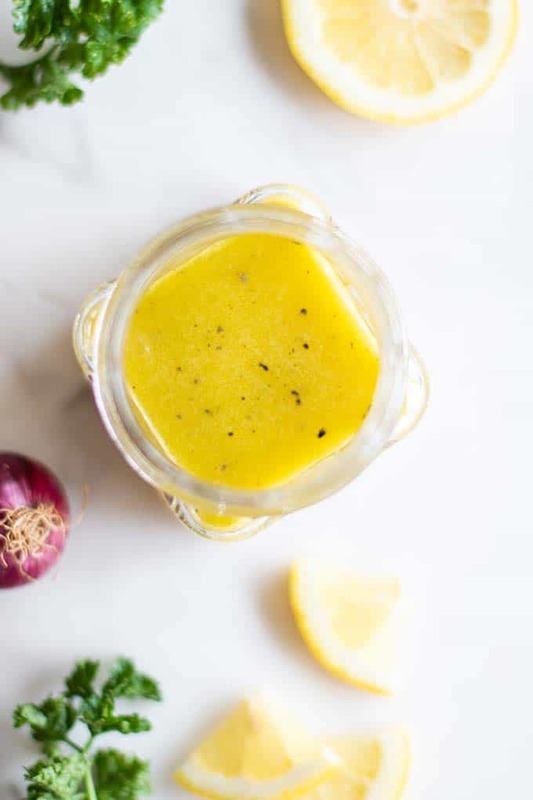 What brings all the flavors together is a bright lemony vinaigrette. This dressing is so easy to make, and you’ll find yourself pouring it on everything! Such a great way to add a pop of brightness and flavor to a meal. The blend of spices coating these chickpeas is what really takes this salad over the top! Cooking with spices not only adds flavor, but also antioxidants with powerful anti inflammatory properties. My favorite spices to work into my recipes daily are cinnamon, turmeric and ginger. They work well on meats, in sweet recipes or smoothies, and also as a flavorful coating for these crunchy chickpeas! To coat the chickpeas, mix up some cinnamon, cumin, turmeric, ginger, salt and a pinch of cayenne. Stir them together. First drizzle the chickpeas with olive oil and lemon juice, and the shake the spices over them, and stir to fully coat. Lay them out on a baking tray with cubed butternut squash and beets, and they are ready to go in the oven. I used a can of chickpeas here (without added salt, since I would be adding this coating), but feel free to cook your own chickpeas if you use them a lot! This salad is a great lunch or dinner, and is perfect for meal prep! 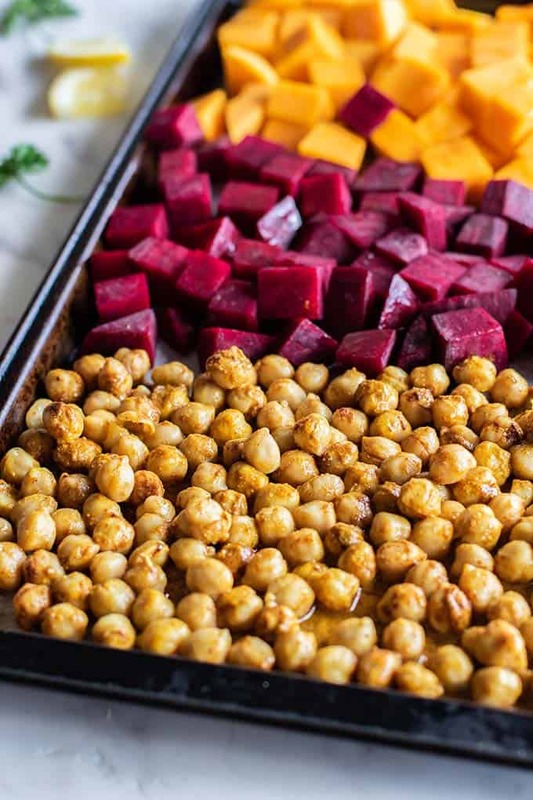 Roast Chickpeas, beets and butternut, as in recipe. Layer quinoa, roasted veggies, and chickpeas in containers, and drizzle with the dressing. Keep the tomatoes, cucumbers and herbs in a separate container, and mix together before serving. This keeps the veggies from getting soggy from sitting in the dressing for too long. A Moroccan Salad with Quinoa and Chickapeas -- soon to be your new favorite lunch! 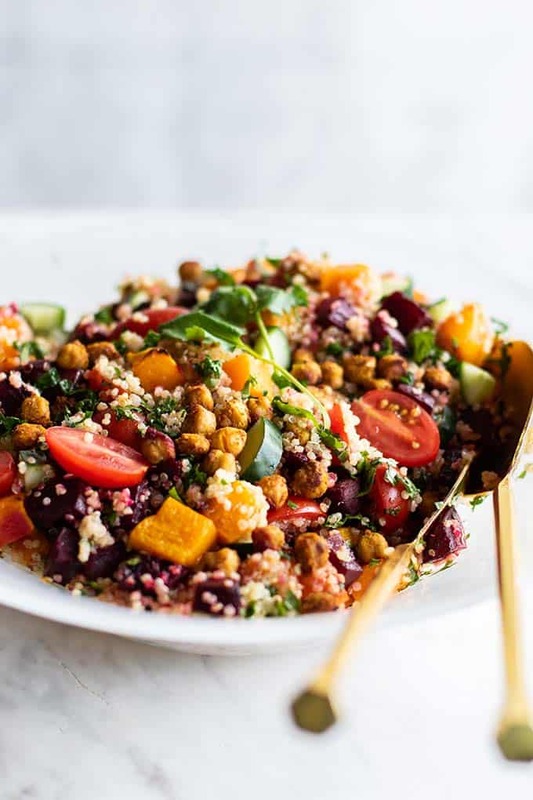 This healthy and hearty vegan quinoa chickpea salad is loaded with veggies, plant proteins, and pulled together with a bright and zippy lemon vinaigrette. 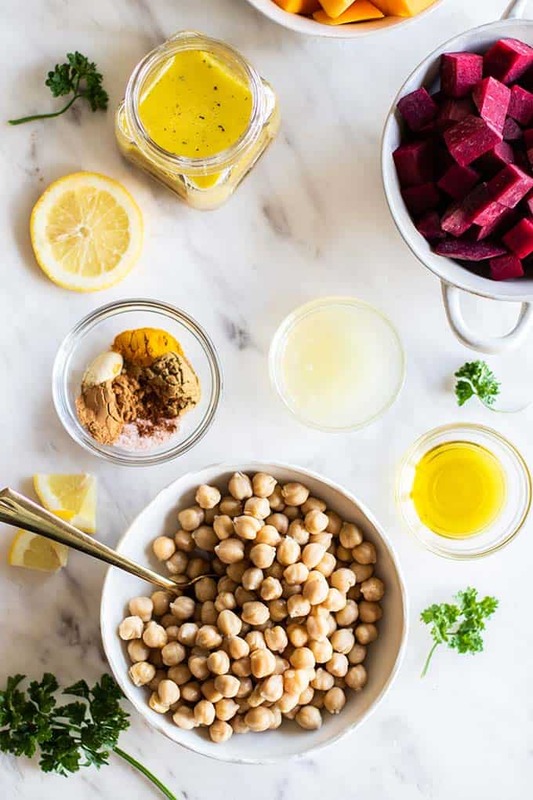 Add the chickpeas to a bowl, and drizzle with lemon juice and olive oil. Mix all spices together in a small dish, then evenly coat chickpeas with the spices. On a large baking tray, lay out cubed butternut and beets, and spray with olive oil. Leave 1/3 of the baking tray to also lay out chickpeas. Bake butternut, beets, and chickpeas for 25-30 minutes. Layer quinoa, roasted veggies and chickpeas, and fresh tomatoes and cucumbers with chopped herbs. Toss salad with lemon vinaigrette. This Moroccan Salad post may contain affiliate links, meaning if you make a purchase, I will receive part of the sale as a comission. This helps me continue to bring you lots of fresh and inspired recipes! Hi! I don't have an oven, do you think I could cook the ingredients in a pan? Should I maybe boil the butternut a but beforehand?Thanks for the great recipe! Hi Charlotte! You definitely can make this on a stovetop -- it will just be a little more time intensive. I would saute the squash and the beets in a large skillet on medium -- it will take a while, but it will work for sure! You can also buy precooked beets at the store and then just saute the butternut.